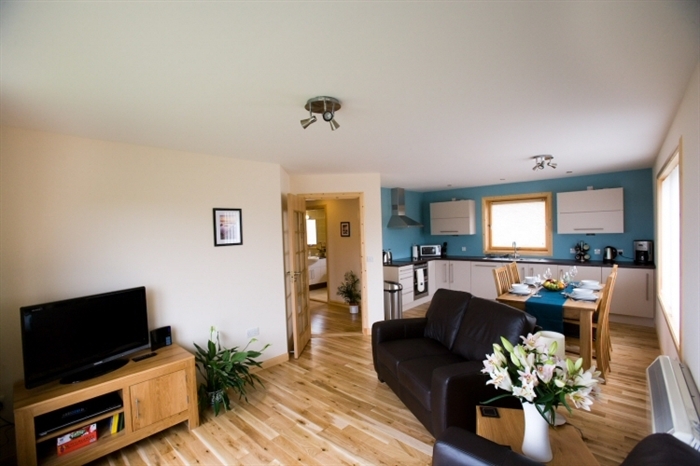 Self Catering Accommodation in Shetland Hillside Brae is an ideal Shetland base. Brand new in 2009, it's really comfortable, beautifully finished and very well furnished, with a four-star rating from Visit Scotland. There are two good-sized bedrooms and the open plan living area has all the space you'll need to cook, dine and relax in style. Fittings and equipment are of excellent quality and features such as free wifi meet the needs of today's holiday or business traveller. If you want to be entertained, you can settle down to watch television or a favourite film. Alternatively,you might simply want to take in the great sea view. 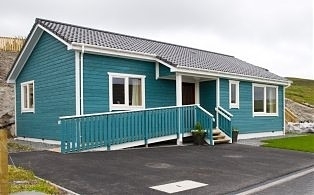 The house is situated in Gulberwick, a rural area that, thanks to its convenient location, has seen new private housing development over recent years. The surroundings are peaceful and much of the land is still devoted to grazing sheep and Shetland ponies. If you arrive in Shetland by air, you can be at Hillside Brae, by car or bus, in little more than half an hour. If you travel by sea to Lerwick, the islands' capital, the house is less than ten minutes' drive from the quayside. If your mobility is limited, you'll find that there is easy access to the house from the adjacent parking area. Hillside Brae is a holiday home of exceptional quality. There are two cosy, fully carpeted bedrooms, a double and a twin, each with generous built-in wardrobes. The bedroom curtains and blinds are fully lined so that you won't be woken too early by Shetland's early midsummer dawn. The bathroom is stunning: fully-tiled, it has underfloor heating and a great, mains-pressure shower over the bath. The open-plan living, dining and kitchen area is a perfect place to relax. The smart and spacious kitchen area is superbly equipped with integrated dishwasher, fridge and freezer. There's a double oven with hob and a microwave. All the other equipment you're likely to need is at hand, including kettle, coffee percolator, toaster and an excellent range of utensils. The dining and seating areas feature attractive solid oak furniture and really comfortable leather sofas. The widescreen television offers a wide range of Freeview channels and there is also a DVD player, so you can watch your favourite films. The free Wi-Fi will let you catch up with your e-mails or write your holiday blog. A selection of games is provided, too. The utility room is equipped with an automatic washing machine and condensing tumble drier. You'll find plenty of space for outdoor clothes, boots and equipment. Outside, there's space to park up to three cars. From there, ramped access to the door makes life easier for anyone with restricted mobility. There's a small grassed area at the front and space at the rear to sit outside.